Let’s be honest. Is there really any way sweeter to tell someone you love them than after a pensive sip from a fine china teacup before a smear of clotted cream over a scone? Of course not. There’s nothing more warm-your-heart isn’t-this-quaint and fantastic than Valentine’s Day afternoon tea. It’s far less intimidating than an eight-course dinner. It’s more relaxed than rooftop drinks. And quite frankly, it doubles as a perfectly acceptable excuse to eat a profiterole and a macaron (or seven) in the middle of the day between meals. Valentine’s Day afternoon tea is a thing, and it is marvelous. This February, several of Bangkok’s greatest tea rooms and lounges are shaking up their regular menus with a swoon-worthy romantic twist. Not just reserved for strawberry-feeding and champagne-sipping couples, these can be enjoyed in the company of friends or family as well, for a beautiful way to celebrate the special day. As it turns out, love may be in the air this month, but it’s certainly at home in a cup of tea and scone, too. Read on. 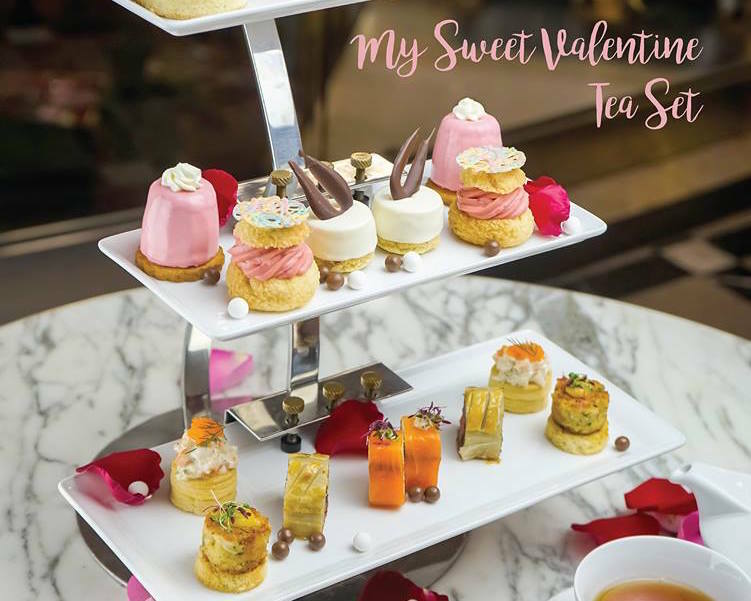 Siam Kempinski knocks it out of the park with a grand selection of homemade desserts and delicacies this month, serving up their special Valentine’s Day Afternoon Tea at Hanuman Bar. 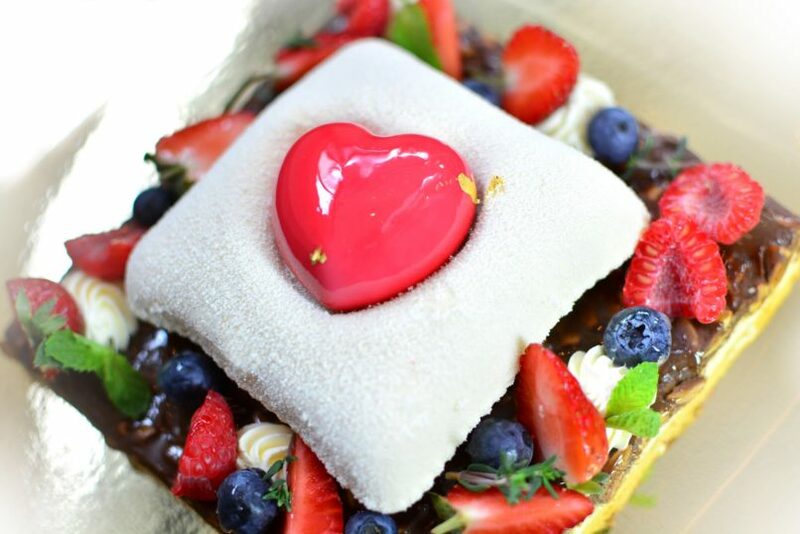 Located on the ground floor of the hotel, couples will get to enjoy champagne-marinated forest berries with a coconut espuma, an Earl Grey chiffon cake with citrus confit, and a petit Baumkuchen tube with Dulcey cream, as well as a show-stopping foie gras and raspberry profiterole with port wine gel. Of course, the quintessential scones are not to be missed, served with classic clotted cream, as well as passionfruit curd and homemade cassis jam. Sweetly sublime, and wonderfully indulgent. The Valentine’s Day Afternoon Tea is served daily from 1-14 February from 2pm to 5pm, and is priced at THB 750++ per set. 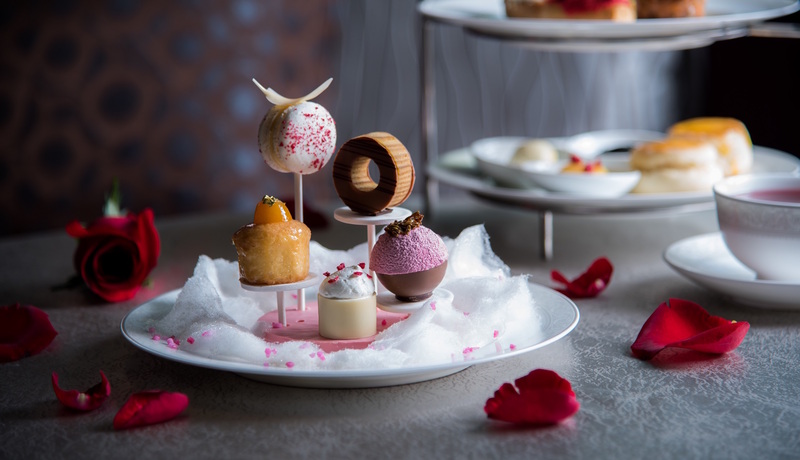 For a truly one-of-a-kind afternoon tea experience this Valentine’s Day, look no further than 137 Pillars. 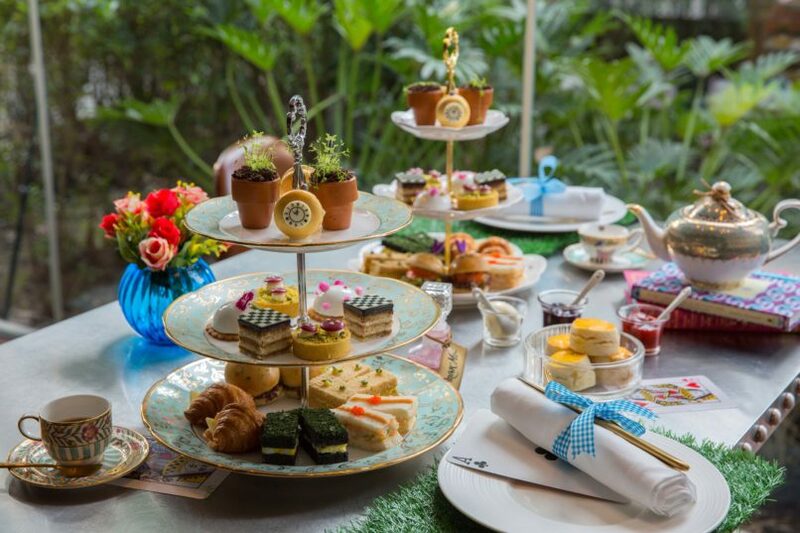 The luxury boutique hotel is inviting guests to tumble down the rabbit hole for a Mad Hatter-themed tea party, inspired by Lewis Carroll’s fantasy tale Alice in Wonderland. Served at the hotel’s Bangkok Trading Post Bistro & Deli, star guest chef Penny Jirayuwatana presents a whimsical ensemble ranging from a Tick Tock Gold Clock Macaron over to a Talking Flower Pear Mousse and White Rabbit’s Carrot Pot. These come alongside British afternoon favourites, such as coronation chicken and Marie Rose prawn cocktail sandwiches. Paired with local and organic Monsoon Teas, here’s an afternoon tea that is very fun and highly Instagrammable, and a great one to enjoy with a group of friends, too. We highly recommend you try the blue – or mangosteen – tea; you’ll really feel like you’re through the looking glass. The Mad Hatter’s Afternoon Tea is served on 14 February, 16-17 February, 23-24 February, and 2-3 March from 1pm to 5.30pm. It is priced at THB 950++ per person, or at THB 1550++ per person with a demi bottle of Moet Rosé Imperial Champagne. Pastries and desserts are cute and all, but for those who take the ‘tea’ component of ‘afternoon tea’ very seriously, there’s no place like the 1823 Tea Lounge by Ronnefeldt. A serious hot cuppa haven, the German tea maker is presenting a special ‘My Sweet Valentine Tea Set’ this February, featuring all the sweet and savoury treat trimmings, and two exclusive tea blends as the star. Choose from the Ronnefeldt Red Rose Flavoured Black Tea and the Ronnefeldt Soft Peach Fruit Infusion, for a beautifully indulgent sip. After all, they say that a tea is like a hug in a cup, and if you need a hug this Valentine’s Day, here’s where you need to head. 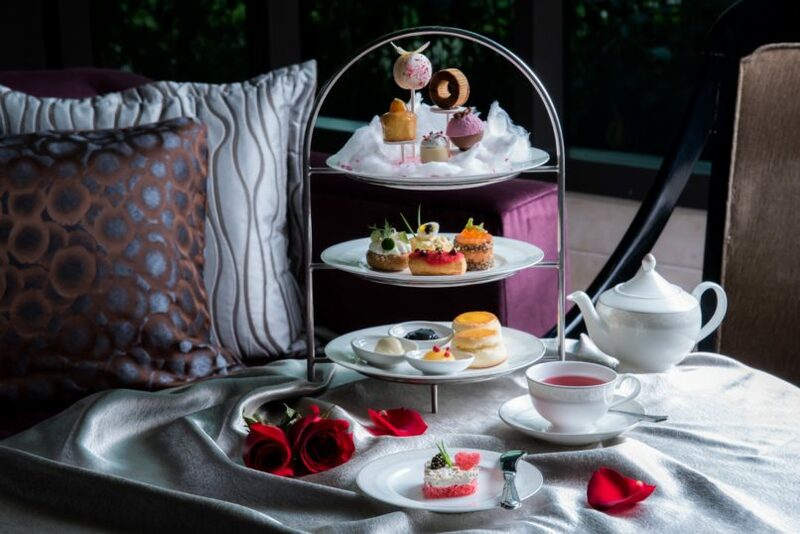 Inviting guests to the stylish and relaxed Balcony Lounge, the Intercontinental Bangkok is serving up a hearty Valentine’s Day afternoon high tea set for those with a big appetite and big heart eyes for a decadent midday snack. To name just a few, guests will get to nibble on tomato and cheese with truffle butter, a carbonara quiche, and a tomato, onion, and caper pissaladière. For sweet treats, there’s everything from a strawberry dome and chocolate cake, over to orange financiers, eclairs, and chocolate pralines. Of course, the classic scone and jam are not to be missed, and alongside a selection of premium teas, it’s the best way to ensure your heart (and your belly) will feel so full this Valentine’s Day. The Valentine’s Day Afternoon High Tea Set is served throughout February from 2.30pm to 5.30pm, and is priced at THB 550++ for one, and THB 850++ for two.